I did this Smurfiette’s House Cake for my daughter’s 4th birthday. I was reading one of Debbie Brown’s books and when my daughter saw the image of this cake she immediately fell in love with it although she never saw any Smufs cartoons before. Actually the cake consists of two bowl cakes, one being slightly bigger then the other. Cover the small cake with yellow sugarpaste and the bigger one in purple sugarpaste. Put the big cake on top of the small one so that it looks like a mushroom. Now there is a lot of sugarpaste modelling work which you have to do. Mainly this consists of the door, windows together with their shutters and curtains too, the balcony, the chimney and of course the Smurfs. I don’t like to copy exactly the cakes on the books so in order to add a personal touch I changed the shape of the balcony, I added the tiny coloured flowers in order to give it a more girlish look and I also laid some green coloured coconut allover the cake board so that it looks like grass. Finally I piped the birthday greeting on the ‘grass’ with some royal icing. 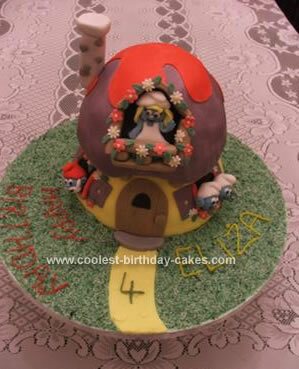 I’m looking at doing a Smurf cake for my almost 2yr old and cant find a good recipe. Do you remember which of Debbie Brown’s books had the Smurf cake recipe?